This tutorial was written with Windows 7 in mind, but the principle applies to all versions starting from 7. If User Account Control is enabled, programs run at medium (Or lower) integrity, even if the user starting them has Administrator rights. This limits damage malware can do to the computer, as it can only interact with user files. When a program needs to run on a higher integrity level, it has to prompt the user to give it admin rights. Always notify: User is notified any time anything needs elevated privileges. Notify me only when programs try to make changes to my computer (Don't dim the desktop): Doesn't dim the desktop when showing a prompt. Less secure than above level. Never notify: User is never notified about changes to the computer. If a user is an administrator, they can press "Yes" to give the asking process higher integrity, or, if they are not an admin, they have to type in the administrator password. Our goal here is to get a process to start with high integrity without interacting with the user. 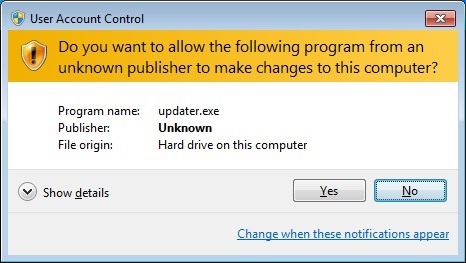 This technique will work only if they are an administrator, and UAC is not at "Always notify" level. 0.1 If DLL is already loaded, use it. 0.2 If DLL is on the list of known DLLs, stored in registry, load it from the path on the list. However, some programs look into the current directory first, allowing us to hijack the search and make it load our DLL. Be signed with a certificate from Microsoft. Be in a secure directory. Have the "AutoElevate" property in it's manifest. A program which meets those conditions can elevate without a prompt on the default settings. Executable must be vulnerable to DLL hijacking. Executable must have the ability to auto-elevate. We have to be running a medium integrity process. User must be in the administrators group. UAC settings must be left on default values, or lower. Copy our malicious DLL to a vulnerable program's directory. Execute the program, so it loads our malicious DLL. The first step might seem impossible, seeing as we need to have admin privileges to copy files to protected locations, such as C:\Windows\System32. But quite conveniently, we can use the Windows Update Standalone Installer (wusa.exe) to unpack cabinet files into secure directories. That is possible because wusa can elevate to administrator without prompting the user. The program we will be exploiting is called Mcx2Prov.exe. It is located in C:\Windows\ehome, and the malicious library needs to be called cryptbase.dll. Turn our DLL into a cabinet file. There is a tool on windows called makecab which will create the file for us. Be careful to use the absolute path to the cabinet file. You won't get an error if extracting fails, so double check everything worked correctly. Pwned! There is another way to copy files, using code injection, and vulnerable executables vary by Windows version. Nevertheless, this exploit is quite reliable and easy to execute. Do not unnecessarily give users admin rights. Set UAC to Always Notify (Extremely annoying). This is exactly was I have looking for lately! I was having trouble trying to bypass uac in wan! I will try it out! BTW, is there a way to tell which UAC level the victim has? If it returns the value "5", bypassing is possible. dll hijacking has always been an intimidating subject that I've hesitated to giving a try. Thanks to your tutorial its not anymore THANKYOU! cmd> wusa cryptbase.tmp /extract: --> but it shows a GUI box asking for selecting the location like we see when we download something and it asks where to store it. Its not practical I think. Do you have any idea why its not working?